"Thank you really very much for a wonderful m4b converter utility it is much appreciated." "Hello, thank you for an awesome m4 converter solution. I am succefully imported the converted m4a files in Windows Movie Maker." "If only everything in life was as simple. No frills, no adverts and no hidden code to screw up my PC. Wonderful job, well done." Whether you are looking for an MP4 audio converter, a 3GP converter, or just about any other kind of audio converter, one solution that provides you with all of the features you need is simply called Free M4a to MP3 Converter. However, in spite of the name of the software, it actually supports many other popular formats as well. 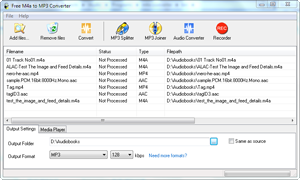 It includes an AAC to MP3 converter, an AAC to WAV converter and an M4a to WAV converter. With an audio books M4b to MP3 converter, you can also quickly convert any audio books for use on your mobile devices. When it comes to free software that converts audio files, many people are understandably concerned about the quality. This solution not only does the work quickly and for free, but it also provides high quality results without decreasing the quality of the original file at all. All of the supported formats have their own settings so you can get the optimized results that you need. For example, if you want to have the very highest quality MP3 files on your audio device, you can use the converter to keep the songs in professional audio quality of up to 320kbps. The software also has an internal audio player which is a great way to preview files before you convert them. To save you even more time, the program supports batch processing. With batch processing, you can leave the software to automatically convert all of the files in a set of folders rather than having to convert one file at a time. This saves you a great deal of time and as the software does all the hard work for you. The interface is also a user-friendly and does not require any special knowledge to use. Converting files is simply a matter of a few clicks. Free M4a to MP3 Converter is the perfect solution for anyone who enjoys listening to music or audio books when on the move. Beforehand, you may want to check which formats your audio device supports. Unfortunately, many mobile phones and other portable media players do not support many formats by themselves. Because of this, it is necessary to convert your audio files so they will play back on any standard device. The MP3 format has long been the industry standard for digital playback and this software will convert files into normal MP3 files without any complicated extra features such as variable bit rate which may make them incompatible with certain devices.